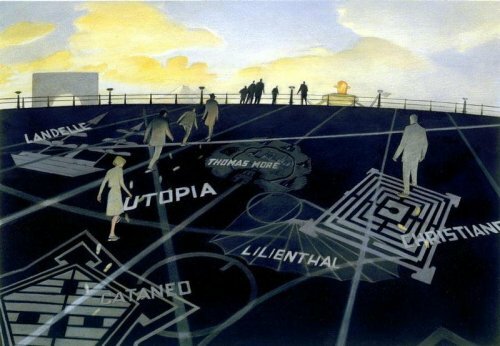 The outputs of the corridors of the Writings lead to an immense esplanade at tge bottom of which is the Panorama of the Utopias. Seen from the output of the corridors, the Panorama is hardly visible because the inclined ground gives the illusion that the end hides a pit where the light is sometimes stronger there. The ground is strewn with sign representing labyrinths or strange plans. The Esplanade marks a kind of break within the "Planet of Visions". One passes from the known world of the men to that of the Utopias. From known past to the hypothetic future. It is here that the attentive visitor will understand which is the first symbol of Passage. It is indeed present in all the rooms which were crossed to arrive to the Esplanade. It is visible in "the world around the year 1000" and in "the corridors of the Writings", the sound of the "Paradise" continuously recalls us what it represents and it is found finally on the ground of the Esplanade.